Lake County is located in the geographical center of the State between the Florida Cities of Orlando and Ocala. The County contains over 1,000 lakes and 202 square miles of water. Lake County's terrain is very different from the rest of Florida, which is mostly flat. Averaging 184' above sea level, it contains some of the highest elevations in the State. Lake County is the home of the Harris Chain of Lakes covering over 50,000 acres connecting to the Atlantic Ocean through the Ocklawaha and St. John's Rivers. The weather in Lake County is slightly cooler than in South Florida or on the coasts. The average January temperature is 59.7 degrees F, and the average August temperature is 82.4 degrees F. The average rainfall is 47.57 inches, falling mostly in the rainy season between June and October. We have distinct seasons with beautiful foliage color changes, but our winters are mild. There's just enough of a nip in the air to remind you that the cooler season is here. 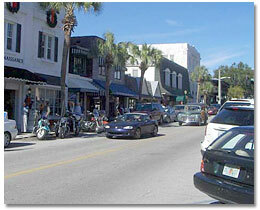 In 2012, the largest Cities in Lake County were Clermont, Leesburg, Eustis and Lady Lake. The City of Lady Lake is the home of "The Villages", the largest planned retirement community in the United States with a current population of over 100,000 residents. Lake County is bordered on the North by the Ocala National Forest. The forest covers a total of 383,573 acres of pristine woodlands, ecological sites, trails and natural springs. The City of Umatilla, with just over 3,500 residents, is the gateway to the National Forest. 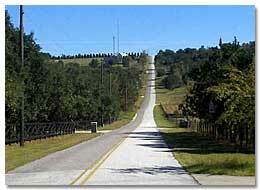 The beautiful heart of Lake County is the Golden Triangle Area. The triangle is made up of the cities of Mount Dora, Tavares and Eustis. Tavares is the county seat housing the County Court House and Government Centers. Tavares is also known as America's Seaplane City. Eustis is a small city that is rich in history. Nestled along the eastern shore of Lake Eustis, the 7,000 acre lake provides a picturesque background for this beautiful small town where friendliness is not a thing of the past. Lake County became a legal entity on July 27, 1887 when it was created out of portions of Orange and Sumter counties. It was named Lake County because there were over 1000 lakes within its proposed boundaries. Tavares became the county seat after 3 elections that included political maneuvering and outright corruption. As part of his effort to have Tavares named as County Seat, Major St. Clair Abrams, who founded Tavares, borrowed $10,000 and built a courthouse, which later was known as the Pioneer Building. In 1922 the county floated a $250,000 Bond Issue and built a new courthouse which is now known as the Historic Courthouse. The first Post Office was established in Okahumpka in 1845 when Florida was still a territory. In 1890, the first census was formed and there were 8,034 people in the county. Agriculture was the main industry until the freezes of 1983, 1985 and 1989. Walt Disney's parents were married in a small town named Kismet, which no longer exists, on December 27, 1887. As a child, Walt used to spend vacations visiting his Aunt Jessie Perkins in Paisley. If you have questions about Lake County Florida, please contact us.